Before you sign up to take the Literature GRE, you'll want to be sure that your prospective programs require it. If you're applying for an MFA in creative writing, you might not need to take this exam. If, on the other hand, you're working on an MA or PhD in English, many departments do require this exam. What's more is that if you score very well on the exam, some of your prerequisite courses may be waived — helping you to graduate faster. In the United States, registering for the exam will cost you $140. Remember that many schools will also require you to take the General GRE, so budget accordingly. Also remember that for each school you apply to, you may be required to submit both GRE scores. Therefore, part of your preparation will include figuring out exactly how many schools you can afford to apply to and how much it will cost to apply to each school. As soon as you think you might want to apply to a graduate program requiring you to take the Literature GRE, take a pre-test to evaluate where you are in terms of score and to get a sense of what you know and what you don't know when it comes to the literature that will be on the exam. 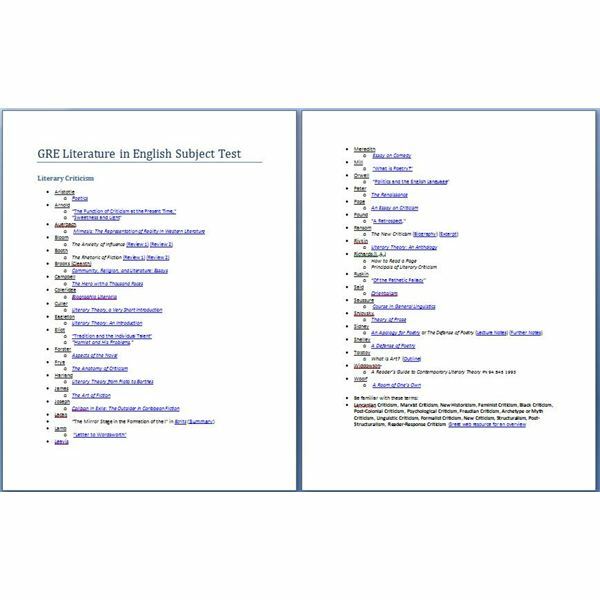 You can find a sample exam at the ETS website, or in a book such as Cracking the GRE Literature in English Subject Test. Time the test as you would during the actual exam. Once you complete the exam, check to see how you scored. Note areas of weaknesses and areas of strength on the exam. If you got all the Shakespeare questions correct, there's no reason to study Shakespeare. The list I've provided is 24 pages long, but don't worry — you don't have to read everything on the list. It's meant to be a guide to help you determine where you need to begin. You can go through the list and check off any works you feel familiar with. You can make note of works you have, and for those items that don't have an electronic version, you can go through and make note of the library call number. That way, when it's time to procure the book or reference, you'll have it at your fingertips. There are two pages of authors and works in my list of literary criticism. I wouldn't jump in and start reading just yet. First, turn to the terms listed on the second page. You'll want to create flashcards for each of the terms. On the front, list the term, and on the back, give a brief one or two sentence description of the term and a list of the authors who exemplify that movement. Now, you can go through the list. Anyone you feel familiar enough with after creating your flashcards and notes about movements, you can cross off your list. Read all short essays. Read the introductions, table of contents and the last few paragraphs of each chapter of longer works. Take good notes on what you read. You don't need to write everything down, just key information like who the author was responding to, what the main argument was and supporting points to the argument. Pay attention to the writer's style. Some of the questions on the exam ask you to identify which writer wrote what passage. As with literary criticism, go to the end of the poetry list. There are three links to poetry terminology you will want to be familiar with. Like you did before, create a stack of flashcards defining the term, and giving a few examples of poets using that technique or style. The reason I'm having you start this way is it will help you to recognize various features when reading. As you will have noticed, there are many poems on the list. My suggestion is to read as many of these as you can — especially when it comes to the shorter works. There are two strategies to take with the poetry. You can read through the list in alphabetical order, or you can read in chronological order. That means you would start with Homer and then read through the most contemporary of the works. By taking the second approach, you can see the development of different movements. Make notes of different features of each poet's works. You will want to keep this list brief — three to five bullet points will be fine. Once you've finished reading an author, you can then make a flashcard outlining key points to remember about his or her work. for each of the works. The more limited your time, the more dependent you will be on the book summaries. Thus, as soon as you think you might need to take the Literature GRE, start studying! Go ahead and make flashcards for each work as you did before. Shh…don't tell anyone, but this is my suggestion for studying the dramatic works. First, study dramatic terminology if you need to. Study the summaries. Make note of characters. Scan the play. Now, see the play or movie. Drama was meant to be watched, not read. Yes, some movies mess up the plot of some works of literature. However, you'll have read the summaries and scanned the plays. Make it a weekly ritual — drama classics day at your place! Who's bringing the popcorn? Of course, you'll have your notepad out and make note of key plot points and character notes. There's no reason why you can't have fun with this, and many of the plays have movie versions available on Netflix. Follow the same approach you have been when studying nonfiction and essays. Read any of the shorter works. If a summary is available, use that to help cut your reading list down. If a summary is not available, read what you can to get a sense of the work and the author's style. Finally, this is a great strategy, and here's what I did when studying for my master's degree comps. Put together a study group of other motivated individuals in your area who plan to take the exam. Instead of tackling the entire list on your own, delegate. Divide the list up and assign each person a specific number of works to cover and summarize. Meet at least once a week prior to the exam date and perhaps each day leading up to the exam. Each person will then present summaries and copies of brief one-page outlines for the rest of the group. This requires a lot of individual discipline on the part of group members; however, it is very effective. All three members of my group passed the comprehensive exams we'd studied for.